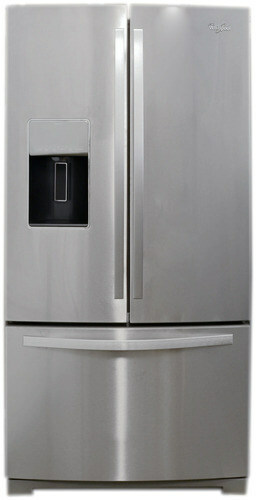 This French door fridge has a stainless steel finish. On the left fridge door, you’ll find both the appliance’s control panel as well as a through-the-door ice and water dispenser. With a large capacity—advertised at 29 cu. ft.—it's important that the inside sports more than just your average layout of shelves and drawers. Blue-tinted LED lighting gives food a clean, appetizing appearance. Also, it's worth mentioning that one of the adjustable shelves has a retractable portion for easy storage of tall items like flowers and wine—how romantic! To top it off, there are three drawers on the bottom instead of the usual two. Along with the regular dual crisper drawers, there's also a third, thinner drawer between them that's ideal for deli storage. Drawers in the fridge and freezer all slide quite smoothly. One of the adjustable shelves has a retractable portion for easy storage of tall items. At the very bottom of the fridge is a full-width drawer with its own independent temperature control. It has three settings, all of which are programmed in and cannot be altered. These are Meats / Poultry (32ºF), Cold Drinks (36ºF and the default setting), and Deli / Cheese (39ºF). The pull-out freezer consists of three separate sections, plus an In-Door Pizza Storage compartment. It's essentially a thin opening in the door that's wide enough to fit two or three frozen pizzas when they’re placed on their sides. It’s a clever feature, and a necessary one: an average full-sized pizza would not fit in either freezer drawer since the dividers cannot be shifted enough to provide the necessary space.